BCAA Sensation™ is the ultimate BCAA drink mix to fuel athletic performance during sporting activities. Research has shown that Branch Chain Amino Acids (BCAA’s) play a critical role in the muscle building and recovery process. BCAA Sensation™ contains several groundbreaking additional ingredients that have an immediate effect on performance, endurance and muscle building. Each and every ingredient in BCAA Sensation builds upon the strength of the other ingredients to increase its potency, making it the must have cocktail for any athlete that is focused on muscle growth and optimal recovery. Any athlete’s most important amino acid. Leucine is the switch our body uses to turn “muscle growth mode” on through mTor stimulation. mTor is the signal our body produces to increase protein synthesis and decrease protein degradation. Leucine is more than 10x stronger than any other amino acid for increasing protein synthesis. 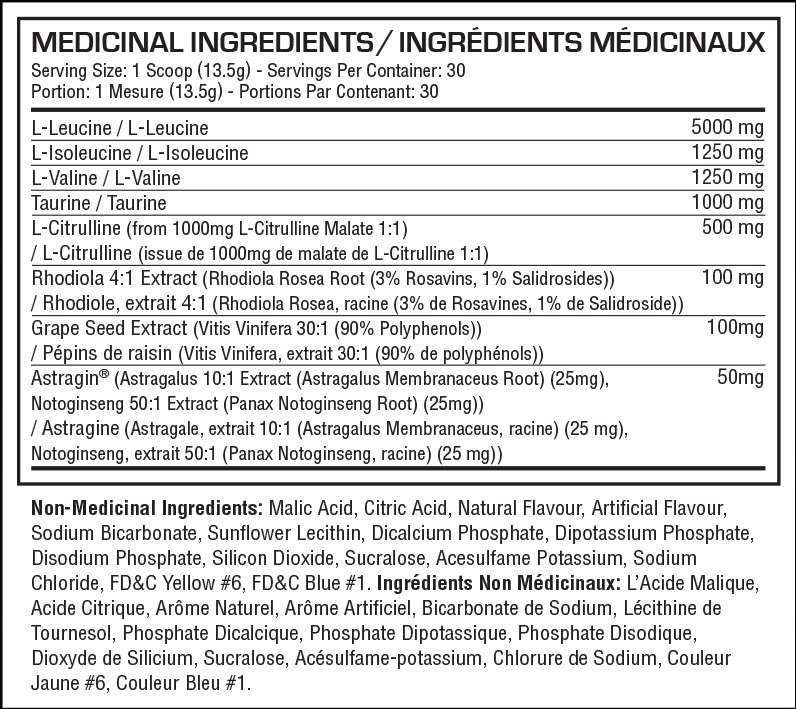 Within minutes of ingesting Leucine our body is stimulated to simply build muscle. Without this spark from leucine, muscle growth and recovery is virtually impossible. Leucine also slows the degradation of muscle tissue by increasing protein synthesis. Fat loss is also stimulated by Leucine because our bodies prefer to burn fat tissue for fuel instead of muscle tissue. BCAA Sensation contains 5 gram of Leucine per serving which is considered the ideal amount to stimulate mTor. The other two BCAA’s. Although less important than leucine, do work together to fuel intense workouts, trigger recovery and protect muscle mass. Citrulline bound to Malic Acid truly does it all for athletes. It delays fatigue, enhances oxygen uptake, increases protein synthesis, prevents muscle loss, improves sexual performance, enhances blood flow and gives a fantastic pump! Best of all, these effects can be seen and felt within minutes after drinking BCAA Sensation™. Citrulline aids in the removal of the performance hindering substances lactic acid and ammonia. Both lactic acid and ammonia are produced during intense training sessions and during diet phases. By removing and reducing lactic acid build up (the burn) you can train longer and harder. L-Citrulline is also very potent at increasing nitric oxide production and natural Growth Hormone release. Nitric Oxide is a natural gas inside our bodies that triggers blood flow. By increasing blood flow, more nutrients are transported to our muscles whilst at the same time promoting a very strong pump. This amino acid is an incredible important ingredient for athletes as it plays a crucial role in performance. Amongst its many functions, taurine increases muscle force production, increases cell hydration, preserves exercise capacity, keeps oxidative stress at bay, enhances natural and healthy testosterone production, increases fat oxidation and enhances the uptake and use of BCAA’s. Taurine is also well know for increasing mental performance and mood, making it a staple in virtually every energy drink. Especially in demanding situations such as a workout, Taurine pools are depleted by the body requiring additional supplementation. Best off all, taurine has the unique function that it can enhance the utilization and uptake of almost every other nutrient that is taken in combination with it. 100% unique and exclusively standardized for Dedicated Nutrition, this rhodiola extract contains almost pure salidroside. Salidroside is called nature’s EPO as it is incredibly effective at increasing endurance through increased red blood cell activity and oxygen uptake. Meaning you can do more reps and sets without becoming fatigued. Using salidroside will almost instantly increase your performance! Although the name sounds quite corny, its usage certainly isn’t! Super Grape™ is our unique grape seed extract that’s exclusively developed to be structurally unique yielding unprecedented levels of low molecular weight polyphenols and epicatechin. This means that Super Grape™ has a very profound effect on increasing blood flow to working muscles through relaxation of the blood vessels. Increasing blood flow to the muscles you’re training will allow for increased delivery of nutrients and thus enhancing strength, speeding up recovery and gives a long lasting killer pump! Minerals that muscles use during strong contractions and to stay hydrated. As we workout we lose these minerals by sweating. By supplementing them, performance can be maintained at the highest level. A truly revolutionary absorption enhancer and nutrient repartitioner. Astragin is capable of not only increasing absorption, and thus the effectiveness, of all ingredients in BCAA Sensation™, but also every other food or supplement you take. 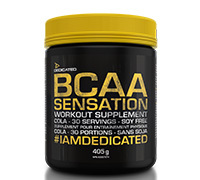 In true Dedicated Nutrition spirit, BCAA Sensation™ contains a fully disclosed formula. We do not have to hide behind fancy “proprietary blends” that basically do not tell the truth about actual ingredients and dosages. Nor did we add a bunch of garbage amino acids or other useless fillers that have no other purpose but to make a label look fancy. BCAA Sensation™ will give you an almost instant performance increase due to its unique combination of tried and true ingredients at full clinical dosage strength and cutting edge real science. BCAA Sensation™ allows you to train harder, grow and recover faster than ever before. The synergetic effect of all BCAA Sensation™ ingredients combined versus separate ingredients on muscle growth and recovery. Mix 1 scoop in 500 ml cold water. ON TRAINING DAYS: mix 1-2 scoops with 500 ml of water and drink before and during your workout.